As the days continue to grow longer, it might be a good idea to start thinking about your spring lawn treatment for the upcoming year. Most homeowners take pride in maintaining the perfect lawn, which can end up being very costly. Or perhaps you’re looking to spruce up your yard in order to sell your home. Fertilizers, sod, irrigation systems, pesticides, and maintenance equipment can run hundreds or even thousands of dollars each year for a homeowner. The simple fact is that you don’t really need to break your budget just to have that lush green lawn. You have to realize that your yard is not the country club down the street. Instead of blowing a bunch of money on your lawn this year, try and find ways to cut back on your expenses by using some of the spring lawn treatment tips below. Here are ten spring lawn treatment tips to help you get started on maintaining a manageable and low cost lawn this year. Do It Yourself – This is a little bit obvious, but why pay someone else to maintain your lawn? The average homeowner can spend $20 to $100 a week just in paying someone to cut their grass. Even $20 per week can top over $500 in an 8 month growing season. Do yourself a favor and take the time to cut your own grass. You may even get a little exercise while you are at it. Aerate – Possibly the single best maintenance you can perform on your lawn is aeration. Grass needs healthy roots to grow, which requires plenty of oxygen available in the soil. In order to promote vigorous root growth, a homeowner should aerate their yard at least once per year, but preferably twice. Spring and fall are usually good times to aerate because the sun is not at full strength. Paying someone to aerate your lawn may be the one exception to the first tip about doing it yourself. Healthy roots means less watering and fertilizing on your part. Raise Your Mowing Height – It is time to face the facts that your lawn will never be the putting green you always wanted. A finely cut lawn can be beautiful to look at during the spring. The only problem is that the roots of your grass will only grow as deep as the blade above the ground. So cutting your yard at one or two inches prevents any additional root growth past one or two inches deep. You can get away with this in the spring, but when it becomes dry you will pay dearly for it. Depending on the type of grass, it is a good idea to raise your mower to 3 to 5 inches in height. 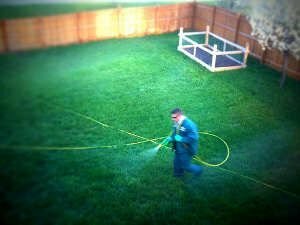 Fertilize Less – Contrary to popular belief, constantly fertilizing your lawn is not a good thing. First off, it is important to know exactly what nutrients your lawn is lacking. Purchase a low-cost soil testing kit so you can figure out what fertilizers to actually buy. If you don’t, you may be throwing money away on fertilizer your lawn does not need. Most of the time, you can get away with fertilizing once or twice per year, as long as you properly take care of your lawn. Look For Discounted Fertilizer and Seed – When you do buy seed or fertilizer this spring, look for marked down or discounted bags at your local store. Many of the home improvement stores discount bags of fertilizer and grass seed that have been damaged. You may be able to find a bag marked down at a heavy discount that has only lost a little bit of its content. Plant Natural Grasses – Fighting mother nature in the heat of summer can prove to be a losing battle. For example, if you live in the south, it is virtually impossible to maintain a bluegrass lawn. The heat and humidity will not allow that type of lawn to grow very long in that region of the country. So instead of spending a bunch of money each year trying to grow your ideal lawn, why not give grasses that are native to your region a try? Instead of a Bluegrass lawn in the south, try Bermuda grass or a type that is native to the area. It will be much easier to maintain and a lot cheaper. Don’t Bag Grass Clippings – Did you know that those grass clippings you are bagging from your lawn can provide valuable fertilizer? Remember all that fertilizer you put down? As much as 50% of it can be lost just from bagging your clippings. These beneficial clippings are a great way to recycle the fertilizers you have already put down and are beneficial for your turf. If you still are not convinced, at least save the clippings to use as mulch in your garden or to start a compost pile. Mower Maintenance – Make sure your mower has been tuned up and has sharpened blade(s). Mowing with dull blades actually pulls your grass instead of cutting it, which can be harmful to the turf. This causes unnecessary stress on a lawn which can lead to other problems down the road. Instead of buying a new blade each time, you can actually sharpen them yourself or take them to a professional to get sharpened a couple of times each mowing season. Control the Amount of Watering – Generally, a lawn requires about 1″ of water per week depending on the region you live in and type of grass. Anything more can cause damage to your lawn. It is also a good idea to water fewer times per week at a higher rate than many times per week with just a little amount. Watering longer once or twice per week promotes deep root growth as opposed to less water many times per week. Deep watering forces the roots to grow deeper whereas shallow watering prevents the roots from seeking out that water. Know When to Water – Do you have a sprinkler system at your home? A sprinkler system can be a huge money and time saver if managed properly. The problem is that homeowners forget to manage their systems which end up costing them more in the long run. How many times have you driven by a house that has their sprinkler system running while it is raining? Knowing when to water and not to water is critical to saving money and maintaining a healthy lawn. Maintaining an attractive and healthy lawn does not require a lot of money. Taking the necessary steps this year in your spring lawn treatment can help you fight mother nature and grow healthy turf. Not only will you have a better lawn, you will also save some extra money on maintaining your lawn. What other spring lawn treatment tips can you offer that will help to save money? DIY Projects: Should You Do It Yourself?